Agriculture Minister, Noel Holder has unveiled that among other things there are plans in place to study the possibility of opening an aquaculture and livestock farm among others at the Wales Sugar Estate. This is after Government had announced that it plans to close the Wales Sugar Factory at the end of 2016 since it would be unable to upkeep operations at the plant. Before laying the plans for the estate, Holder stated that the present attack from the Opposition on the proposed closure of the Wales estate factory is political rhetoric. He was adamant that the Government remains committed to the 1700 workers and 774 private farmers from Wales. “An Aquaculture feasibility study will shortly commence. 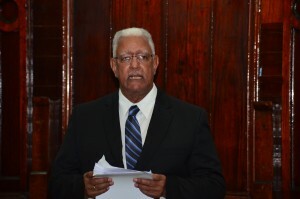 Preliminary indications are that professionally undertaken, aquaculture would be a major profit generator providing reasonable employment,” said Holder. He also pointed out that feasibility studies will shortly commence on other crops. “Work already done indicate a number of well-known crops can be successfully grown on the Wales soils. Again, profitability and employment are key criteria,” the Minister stated. Further, the establishment of a dairy/livestock business utilizing the existing factory building is being explored. The Minister stated that in the intermim, the Guyana Sugar Corporation (GuySuCo) has commenced discussions with its workers at Wales offering them alternative employment at Wales and at Uitvlugt thereby minimizing the anticipated redundancies at this time. “It is expected that the number of redundancies at the end of the year would be lower than anticipated as the non-sugar activities would require skilled and unskilled labour; and vacancies arising at Uitvlugt in the course of the year will only be filled by workers from Wales,” said Holder. In a separate statement issued to the media by the Ministry of Agriculture, government denied claims by GAWU that employees at Wales Estate that have been asked to sign an agreement which indicates whether they will opt to receive a severance package or be transferred to the Uitvlugt Estate. The Agriculture Ministry confirmed that meetings were held on the 1st and 2nd February with the various categories of permanent agriculture employees from the Wales Estate and they were given one week to indicate to management, their decisions following discussions with their families to decide one of a number of options.” Follow up meetings were also conducted on February 8 and 9 with the same categories of permanent agriculture staff for them to communicate their decisions to the officials. But at no time were workers offered a three-day grace period for a decision to be made, as was reported in Inews. The workers were however, informed that staff who opted for the severance payments cannot seek further employment with the Corporation,” said the Ministry. “Provisions have to be made and systems put in place so that workers can have a timely and easy transition rather than waiting until the closure to decide who is going where and doing what,” said the Ministry. The options include similar work for some at Uitvlugt Estate and or cane harvesting positions at the Wales Estate. Some categories of workers would have to remain at the Wales Estate until the end of the 1st or 2nd crops of 2016. The Ministry said a third option is that workers who have attained 55 years of age and have 10 years or more of continuous service could take early retirement. “Workers who do not want to accept any of the mentioned options have the additional option of accepting a severance payment.,” the ministry added. Government recalled that a record was made of workers who were present at the sessions to ensure that they receive their salary for the day. Based on reports in the media, workers misunderstood the reason for recording their names and thought that it was for severance payment and that they did not have to return to work. It was made clear to all workers attending the meeting on Februaryon February 9, that they have to continue being present for work until they are advised otherwise. “Follow up meetings were also conducted on February 8 and 9 with the same categories of permanent agriculture staff for them to communicate their decisions to the officials. But at no time were workers offered a three-day grace period for a decision to be made, as was reported in Inews. The workers were however, informed that staff who opted for the severance payments cannot seek further employment with the Corporation. The Agriculture Ministry says Wales Estate has ceased employing temporary staff, to the extent that they are not required for productive work, in an effort to focus and address the needs and concerns of all permanent employees.